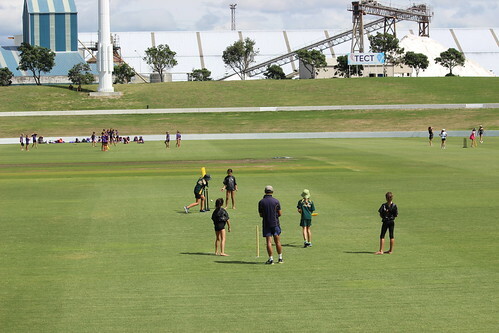 Over 300 hundred primary school girls batted, bowled and fielded their way through another GoGirl Cricket Rainbow Cup at Bay Oval on Wednesday, 13 March. The annual event, now in its seventh year, is an initiative of Bay of Plenty Cricket and Sport Bay of Plenty, and is the largest girls’ cricket event in the country. The event is part of the GoGirls cricket programme in primary schools which aims to get more girls involved in the sport. Year 4 Golden Sands students Leila Arthur, Annie-Jean Lynch, Isla Bisman, Zali Stewart, Evie Metcalfe and triplets Leila, Summer and Pippa Grootjans were just one of the 33 teams from 23 Tauranga schools taking part in the day. The girls were all business as they took to the field, and had one serious aim in mind. Fun. Rebecca Yee, the Women’s Cricket Development Officer at Bay of Plenty Cricket, says the Rainbow Cup is a great way for kids to practice cricket skills in a fun environment. “The beauty of the event is that it revolves around participation and fun. The girls have team chants, they dress up in colourful costumes and they’re making new friends while they play a few games of cricket,” explains Yee. Sport Coordinator Sarah Clark from Golden Sands School has been bringing her students to the Rainbow Cup since it began in 2012. Some of her former pupils, now in high school, have continued playing cricket into their teens. Golden Sands fielded seven teams this year and Sarah says the girls were keen to be involved.